Sage Business Info Services for ACT!1 is a cloud-based service that pulls highly targeted prospect lists from Hoover's™ and puts them into Sage ACT!. Tap into a database of 65 million companies and 85 million contacts to build lists based on location, size, industry, type, people, and more. Build a list in just a few steps using 40+ search criteria where you can specify location, size, industry, type, people, and more. Or, conduct a keyword search when looking for specific keywords, people, and companies. Once you get the leads you need, import them directly into Sage ACT! so you can begin qualifying right away. Target key decision makers within a company you're selling into by viewing a listing of additional people that work within that company—all done from the main contact view in Sage ACT!. When viewing a current contact or company in your existing database, you see other high-profile contacts within that company, plus their title. Click on contact names for more detail to determine if you want to import their info into Sage ACT!. Access Sage ACT! from wherever you are with ACT! 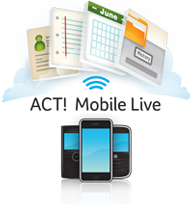 Mobile Live1, a cloud-based mobile service that delivers Sage ACT! to your BlackBerry® and Widows Mobile® device. You'll always have your Sage ACT! contacts, calendar, meetings notes, conversation history, and upcoming activities, because all of this is easy to find and update from your phone. Get more out of the phone you already own. View your Sage ACT! contact and calendar details on your phone. See contact details, meeting notes, conversation history, and upcoming activities, and be instantly informed about your customers. And you can add new details when you're out and about. You're already familiar with your mobile device interface. ACT! Mobile Live1 uses your phone's built-in address book and calendar so you can view, add, and edit contact and calendar details in the same familiar way you do today. Forget about IT nightmares. Go live in three easy steps—simply sign up, set up, and sync. ACT! Mobile Live1 is ready for you wherever you are. Not only can you access Sage ACT! from your phone, you'll have access from the ACT! Mobile Live1 online portal. This gives you online access, plus a backup of your information in case your phone is lost or stolen. And your info is still available when you switch phones later. With Sage E-marketing for ACT!1 you can do so much more than simply send emails and track open rates. Build your business using this cloud-based email marketing service that enables you to execute sophisticated campaigns, while leveraging and building on your existing Sage ACT! information. Email marketing helps you reach your contacts more effectively using proven techniques to build your business. Easily design and edit email messages with a simple online editor. And, send larger quantities of email than your current email provider can handle. Email campaigns are easy, inexpensive, and—most importantly—proven to drive sales. Create multi-step nurture or drip marketing plans then, drop contacts into a campaign designed just for them. Each campaign can include email, call lists, even postcards, for automatic delivery over time. Drip Marketing blends simple functionality, like automatically sending emails when someone fills out a form on your website, with intelligent technology that reacts differently to contacts based on their behaviors, like automatically mailing a postcard to contacts who did not open a previous email. Use web forms to collect information from interested prospects. Consider a web form on your website for visitors to fill out. Once the web form is complete, the information is transferred into Sage ACT! and a new contact is created. It's an easy way to gain interested contacts without any labor-intensive effort from you. Help your salespeople focus on the hottest leads, instead of wading through an entire list of prospects. As your contacts open and click on your email campaigns, Sage E-marketing for ACT!1 assigns a score to each contact based on their interaction with that email. It then gives you a ranked, qualified list of who you should call first—viewable from the contact record in Sage ACT!. Use surveys to better understand your customers. Collect information like contact interests, customer satisfaction, phone numbers, email addresses, and event registrations. Simply link from inside an email to a List Updater Survey and ask your customers to add their information. Then, use it to create campaigns that are most relevant to them.